The last few years I know I am not the only one that has been excited for the year to come to an end. Not because of New Years Eve Parties or Festivus but because there will be a new Star Wars release. 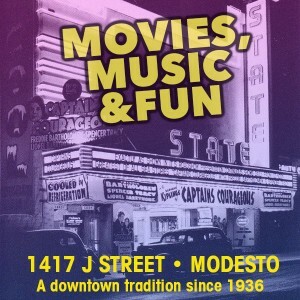 Here in Modesto #homeofStarWars we do it up big. Tuesday, December 5th 7 pm at the Main Auditorium at MJC East. 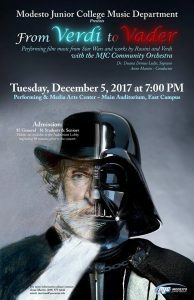 Enjoy a classical evening of Verdi to Vader with the MJC Community Orchestra. Yeah, we take Star Wars serious here in Modesto. 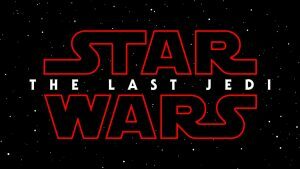 Thursday, December 14th we will be able to catch Star Wars-The Last Jedi for the first, but not the last time for most of us. Rockin’ Holiday will celebrate the premiere of a Star Wars Themed night. Lodge Pole Pickers will once again go intergalactic and be rockin’ the Plaza. Storm Troopers and Jedi will descend on the 10th Street Plaza. Make sure you all come out and join us for an out of this world experience. Saturday, December 16, Central Valley Costumers, 501st, NorCal Cosies and others, will be staging a take over of 10th Street Plaza once again in conjunction with Brenden for The Last Jedi. The Event will run from 1 – 5 pm. There will be Blast a Trooper, Blast with a Trooper, tons of Star Wars Cosplayers and so much more. This event has been out of this world the last two years of Star Wars premieres. 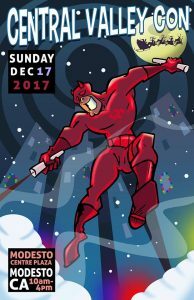 Sunday, December 17, at the Modesto Centre Plaza make plans to go to the Third Annual Central Valley Con brought to you by the folks at StocktonCon. 100’s of Vendors and Artists of all things Geeky. It doesn’t matter if you are looking for comics, toys or pop figures you will find it here. With special guests Vincent M.Ward(Walking Dead) and Power Rangers Jack Guzman and Alyson Sullivan along with Voice Actor Gregg Berger(Star Wars Rebels/Spider-Man) and C.Andrew Nelson(who has spent more time in the Darth Vader suit than any other actor.) There will even be a Con Santa and Elves to take your Geeky Holiday Photos with. Central Valley Con is an all-ages event. Tickets are $5 in advance available at Bonanza Comics and Books, Invincible Comics, Hero’s Vault and Utopia Games and $8 at the door with kids under 12 attending FREE. Take the short drive out to the West Side Theatre in Newman for the NorCal Cosies. 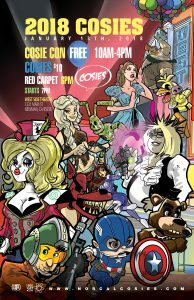 Celebrating its third year as California Only Red Carpet Cosplay Awards Show. Come early for the FREE Pop Culture Convention. The Awards show starts at 6 pm and is $10. Middagh Goodwin LIVES Music. He has been booking and promoting Music, Art and Comedy for years in the Central Valley. He ran the award winning Plea for Peace Center in Stockton for 5 Years and has booked bands from A-Z. Middagh is beginning 2016 with a new position at the Gallo Center for the Arts and celebrating Beat Happy! Music's 30th Anniversary. Read the MAMAView every month and a the Needle Drop 52 Records 52 Weeks.